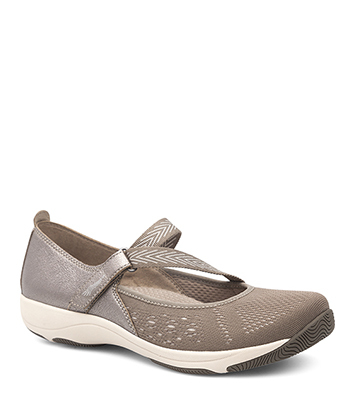 The Dansko Taupe Metallic from the Haven collection. This process could take up to two minutes. Please do not refresh the page. With a sport-inspired look, the Haven is casual and stylish while providing all-day comfort. The removable contoured footbed and the hook & loop adjustability allow for the perfect fit and easy all-day wear. Please allow 1 to 3 days for order processing. Orders are shipped via FedEx to US zip code locations only. (For PO Box shipments, use FedEx SmartPost.) At this time, we do not ship to APO/FPO/DPO addresses or outside of the United States. Shipping charges are non-refundable. All returns and exchanges must be pre-approved by DanskoOutlet.com. Use our online form for a Return Authorization number. We will refuse any returns that are not pre-authorized. Heel height is 1 inch. Metallic leather is a soft leather with a metallic finish. To remove surface dirt, wipe gently with a soft, dry cloth. The Halifax carries the Seal of Acceptance from the APMA (American Podiatric Medical Association). The APMA Seal of Acceptance is awarded to shoes that promote good foot health and is independent proof that Dansko shoes are made with your comfort and long-term wellbeing in mind.